Spanning three generations, New Circle Five is an acoustic improvising contemporary music ensemble. Diverse musical backgrounds result in unique twists as the five explore the one-time only sonic environment of collective creative improvisations. 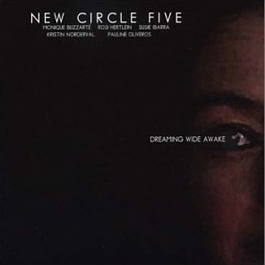 On this, their debut recording, New Circle Five perform their unique blend of collective creative improvisations from dreams of a non-violent world. Monique Buzzarté, trombone; Rosi Hertlein, violin/voice; Susie Ibarra, percussion; Kristin Norderval, voice; Pauline Oliveros, accordion. In Pauline Oliveros’ naming vocabulary, “circle” means “all-women,” so this New Circle Five is a female quintet. Drummer Susie Ibarra set things in motion when she invited the accordionist for a duo concert. Their project grew to a quintet with the addition of violinist Rosi Hertlein, soprano singer Kristin Norderval, and trombonist Monique Buzzarté gave its first concert in April 1999 and recorded its first album three and a half years later. Known for her feverish drumming alongside William Parker and other great names of latter-day Fire Music, Ibarra surprises here with her level of restraint. Her playing is mostly textural, showcasing her resourcefulness as an attentive percussionist instead of her stamina. Norderval alternates between poignant wordless vocal improvisations (she soars in “Ghost Women”) and reappropriations of fragments from Goethe, Gertrude Stein, and Gustave Flaubert (she also throws in a couple of Norwegian texts). Buzzarté, Oliveros, and Hertlein fuse their playing into one entity, whether they choose to drone or to flutter lightly. The level of intuitive comprehension between these three is exemplary and accounts for most of the fascination the music exerts, whereas Norderval’s voice gives it its charm. The aforementioned “Ghost Women” and the opener, “Fifty-Four Years of Mirrors,” provide highlights, but there is hardly a dull moment on this set, although some listeners may find it a bit too homogeneous in sound palette and dynamics.